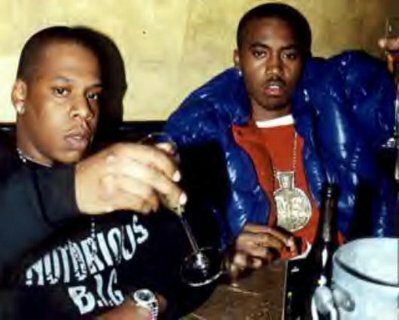 Da Greasy Guide: Worldwide: Nas and Jay-Z end long rap beef. Hov had something up his sleeve. So what better way to show that Hip-Hop has a positive message to give then to end the long term beef between himself and Nas. The stunned crowd of thousands at the Continental Airlines Arena screamed in approval as Jay and his former nemesis Nas appeared onstage together, signifying that two of rap's biggest names had finally deaded their beef for good. Jay-Z and Nas want to set an example for the rest of the Hip-Hop community and want all rappers to dead their beefs. But is this really a truce or a business move? Nas has been slated to join the ranks of Def Jam for ages. But the deals never seem to manifest themselves. So now that Jay-Z is the President of Def Jam will he finally sign Nas to the lable? And Def Jam isn't doing that great or selling as many records as they did during their glory days and the addition of Nas would surely be a win/win situation for all parties involved.